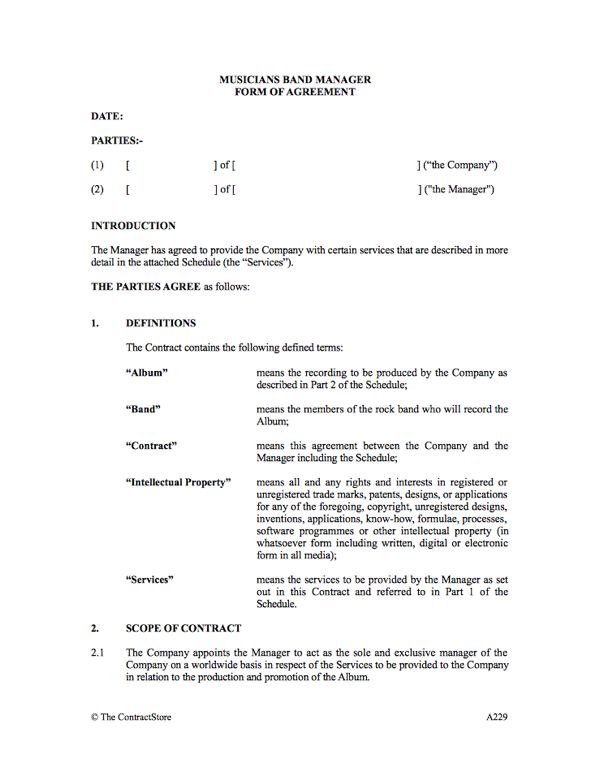 This agreement is for a manager to promote a band or group of musicians for the production and sale of their music. The agreement is between the band manager and a recording company formed by the band members. There is also a Schedule which allows you to detail the services provided by the manager and the nature of the work to be recorded. 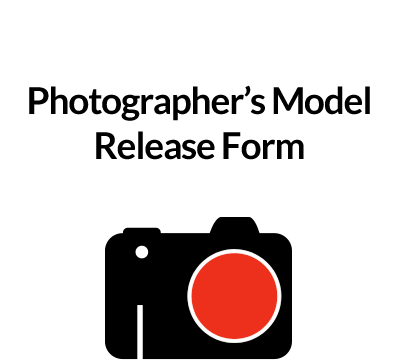 This agreement is designed for use where a manager is appointed to promote a band or group of musicians for the production and sale of a record album. It sets out the services the manager willl provide and deals with the payment he receives – commission on the sales of records plus some agreed expenses. The agreement is between the manager and a recording company that has been formed by the band members. Here key terms used in the agreement are defined. The purpose of the agreement is that in return for a fee and reimbursement of expenses the manager agrees to act as the exclusive manager of the recording company and to promote a particular album (if it is agreed that the manager is to be retained in respect of more than one album the definition of ‘Album’ in clause 1 will need to be amended accordingly). The scope of the manager’s duties and the fee are more particularly defined in the schedule. The text in italic at clause 2.3 deals with the situation where the manager’s pre-estimate of its costs proves to be too low. Either the manager is entitled to recover any additional costs (once a ‘trigger point’ has been reached) or the parties commit to negotiate in good faith to reach a mutually acceptable arrangement. There is much to be said for setting out in an agreement the mechanism by which additional expenses are to be treated. This sets out the manager’s duties to promote the company, report to the company on such promotional activities and act as the company’s agent in negotiations with third parties. Note that the company’s prior written agreement is required in the case of agreements relating to the provision of the manager’s services but that only the company may enter into agreements relating to the sale/distribution of the album. Here the company’s obligations are set out: ensuring that the band attends recordings, the production of the album to a high standard, and co-operation in promotional activities arranged by the manager. Importantly at clauses 4.3 and 4.4 the company ‘warrants’ (or guarantees) that the band members give their authority to the company to enter into this agreement with the manager and that there are no issues relating to third party copyright claims (see also the indemnity set out at clause 7.2). Finally at clause 4.5 (see also clause 7) the company agrees that the manager has the exclusive right to provide the contractual services to the company and has the right to ‘veto’ any attempt by the company to allow third parties to provide part or all of those services. This set out the way in which the manager’s commission is calculated: a percentage of the value of sales and all other earnings. Sets out the procedure for invoicing the company. On either a monthly or quarterly basis (see the alternatives in italic script) the manager provides a statement of commission due and if the company raises no reasoned objections within 14 days the manager will then raise an invoice based upon the statement, payable within 14 days of the invoice dathe manager’s dutieste. The start date of the agreement should be inserted at the start of this clause within the square brackets. This clause provides for the agreement to last for an initial term suggested at 12 months. After the initial term has expired the parties may terminate for any reason upon giving three months notice expiring on each anniversary of the end of the initial period. The advantage to both parties of this apparently inflexible arrangement is that both parties have a degree of certainty as to the near future and may make alternative arrangements in the event that notice of termination is served. In limited circumstances provision is made for early termination: first where the manager is in material breach of the contract (subject to the ‘Force Majeure’ provisions of clause 9), and secondly where there is a change in control of the manager’s company: this reflects the personal nature of the skills/contacts of a manager in contracts of this nature. The manager may terminate where invoices are outstanding after 60 days from the due date (i.e. 74 days from the invoice date). Note that this right is in addition to the right to charge interest under clause 5.5. Either party may terminate on the grounds of the insolvency of the other party. On termination the manager is entitled to all outstanding commission. Where the agreement is terminated before the initial period expires, but after release of the album, it is suggested that commission is payable until the second anniversary of the expiry date of the initial period at a reduced percentage. The effect of this is to protect the manager from loss of commission following early termination. Where the agreement is terminated because of the manager’s insolvency or material breach the company may delay payment of commission until any outstanding services due from the manager have been completed. Where a third party is engaged to provide such services the additional costs to the company may be deducted from the manager’s commission. The commission arrangements at clause 6.6 apply where the band is dissolved before the album is recorded. Intellectual property rights in the album belong to the company subject to a non-exclusive licence granted to the manager for the purpose of providing the services during the lifetime of the agreement. Ech party agrees to notify the other of any claims by third parties for alleged infringement of intellectual property rights. The company provides an indemnity to the manager in respect of any third party claims for damages and any related expenses reasonably incurred by the manager. The effect of the indemnity is to make the extent of the company’s liabilities clear. In return the manager agrees to co-operate with the company in the event that it has to take steps including legal proceedings to protect its interests. The manager agrees to respect the confidentiality of information belonging to the company subject to certain exceptions set out at clause 8.2. The confidentiality provisions extend for a pre-agreed time after termination of the agreement. The right to terminate for material breach at clause 6.2 is subject to an exception where performance of an obligation is delayed by reason of events beyond the control of the parties. However, notice must be given to the party affected by the delay and the party unable to fulfil its obligations must make reasonable attempts to mitigate the effects of such delay. The parties may wish to consider insertion of a provision at the end of this clause allowing termination by the party affected after, say, 60 days. The agreement is subject to English law. Disputes are to be settled by mediation in the first instance and, if mediation fails, by the English courts. This sets out a number of standard clauses dealing with services of notices, waiver of breaches, unenforceability of clauses. 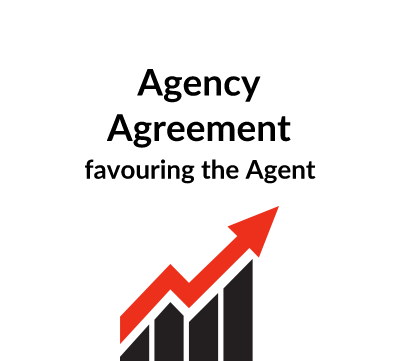 Note that clause 11.2 expressly provides that this agreement supersedes all previous agreement or understanding relating to the provision of the services so as to ensure clarity and certainty as to both parties’ rights and obligations. Clause 11.5 excludes the rights of third parties to enforce the agreement or claim damages for its breach. 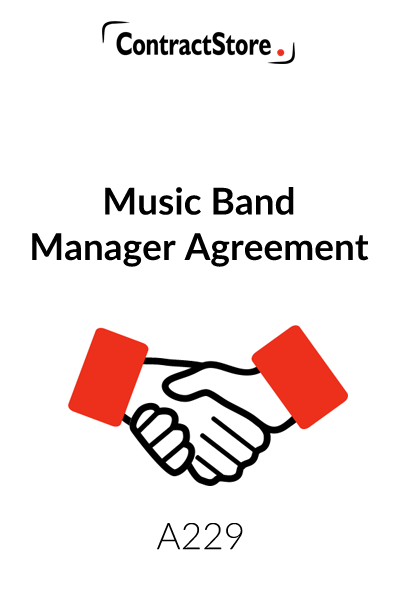 In effect this would exclude the band from taking legal proceedings against either the manager or the company under the terms of this agreement. The band may however have rights under separate agreements with the company and may, in some circumstances have no-contractual rights against the manager. 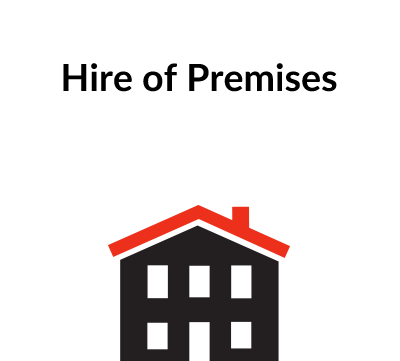 Part 1 sets out the nature and cost of the services to be provided by the manager. The cost of these services are to be borne by the manager save in the event of termination before release of the album (see clauses 6.6 and 6.8). Part 2 describes the nature of the album.